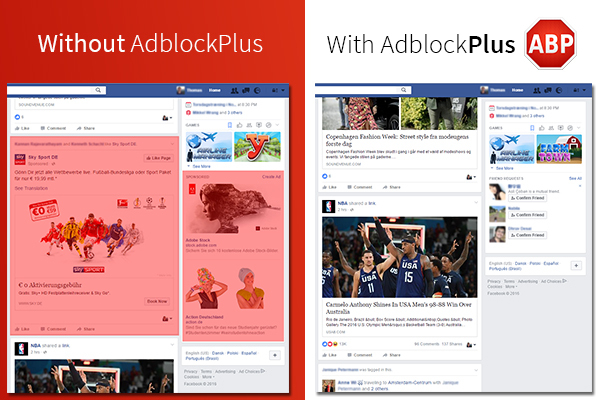 It’s been a busy week for ad-blockers. After Facebook essentially declared war on extensions like Adblock and Ublock last week, the former reported today that they’ve already figured out a fix that would thwart social media sites from showing users ads. But only after throwing a rather hypocritical hissy fit in a blog post. Today’s announcement detailed a crowdsourced fix by the open-source community behind the EasyList filtering mechanism — a filtering tool used by multiple ad blockers. Not many details are available pertaining to the “how” but it seems that the community zeroed in on Facebook’s new way of displaying ads, which involves encoding them differently to slip past ad-blockers. From there, the community just reverse engineered a filter to find these new encoded ads and block them. The filter lists that ‘tell’ Adblock Plus what to block are in fact the product of a global community of web citizens. This time that community seems to have gotten the better of even a giant like Facebook. Although it may have fixed its current problem, Williams seems to understand that the cat-and-mouse will continue with giants like Facebook. This sort of back-and-forth battle between the open source ad-blocking community and circumventers has been going on since ad blocking was invented, so it’s very possible that Facebook will write some code that will render the filter useless—at any time. If that happens, the ad-blocking community will likely find another workaround, then Facebook might circumvent again, etc.